As the county seat of Fort Bend County, Richmond, Texas, is a center for culture and history in the Houston metropolitan area. Founded in 1837 as part of the Republic of Texas, the city was the site of the famed Battle of Richmond on August 16, 1889. This contentious past has largely been left behind; today, Richmond combines a rural atmosphere with the amenities of big city living for its residents. With hot, humid summers a fact of life in the region, finding a reliable source for Richmond, TX, air conditioning repair is a practical necessity for homeowners in this historic city. At All Out A/C & Heating, we specialize in providing expert air conditioning repair services for Richmond residents. We have more than 25 years of experience in helping homeowners in our area with HVAC issues and can quickly diagnose and repair problems ranging from tripped circuit breakers to damaged blower motors. Our certified technicians can provide you with the most cost-effective and reliable solutions for all your Richmond, TX, air conditioning repair requirements and can even help you determine whether to repair your system or to replace it with a new, high-efficiency air conditioning unit designed to keep your home cool and comfortable for years to come. Unit does not turn on: Check to see if thermostat is properly set or if the fuse or circuit breaker has been tripped at the electrical panel. Fan blows but no cold air comes from vents: Condenser unit or compressor may not be functioning correctly; refrigerant levels may be low. Fan does not blow: Blower motor or fan belt may be damaged or malfunctioning; control board faults may exist. Contacting the tech team at All Out A/C & Heating can help you resolve these issues quickly to return your home to cool and comfortable conditions. As an authorized dealer of Trane and Ruud products, we can also provide you with replacement parts and entire systems designed to suit your needs. All Out A/C & Heating specializes in expert air conditioning repair services and prompt response times to help you maintain comfortable temperatures indoors even when the heat and humidity are at their worst outside. Our Richmond, TX HVAC repair team can diagnose and repair your air conditioning unit or provide you with high-efficiency replacement systems to ensure effective climate control throughout the heat of summer. 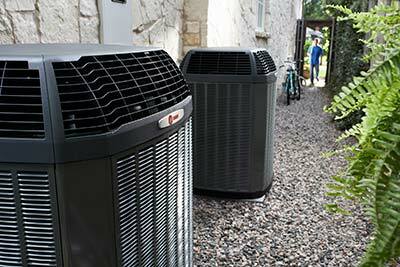 Give our Richmond, TX air conditioning repair team a call at 281-238-9292 to schedule an appointment for service. Our phone lines are open 24 hours a day to serve you better.